With the debate over our debt and the debt ceiling coming to a head, I thought it would be a good time to put the debate into perspective. Which for me, means putting it in pictures. 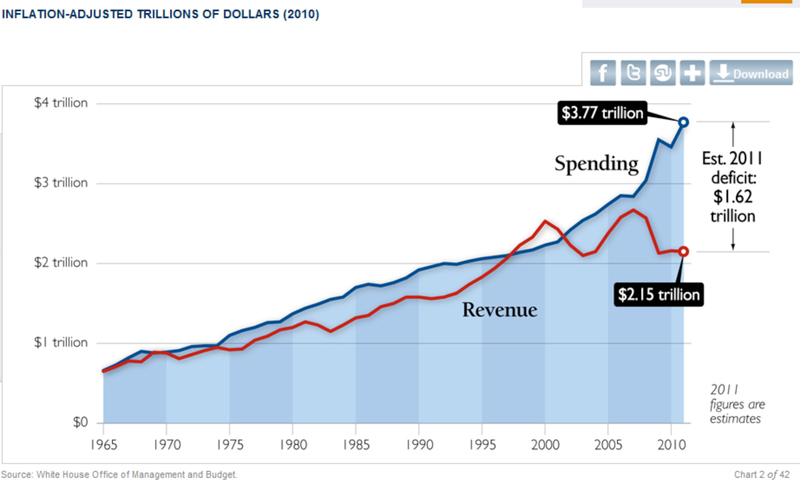 Below in Chart 1 is a graph of U S expenditures vs. revenue. Here you can see that a huge 43% or $1.62 trillion of our entire budget comes from borrowed money. While virtually everyone is in agreement that spending has to be curtailed, the question is what to cut? From Chart 2 below, you can see that nearly half the entire budget is spent on Medicare/Medicaid and Social Security. Add in Defense spending and you’re at nearly 80% of all expenditures. In other words, if we eliminated EVERYTHING except those three budget items, we would still be left with an $800 billion dollar deficit. So while Tea Party sentiment is valued, the reality is that the debt ceiling will be raised, and raised several times over the coming decade. The goal will simply be to slow the growth of our deficit. To accomplish the task of narrowing the deficit will take spending cuts, increased revenue (taxes), or a combination of both. While in the long run there is a huge difference in the economic impact between raising taxes and reducing spending, in the short run the are both economically dissimulative. Whichever way we go it is estimated that the net result will be to reduce GDP by at least 1% going forward. 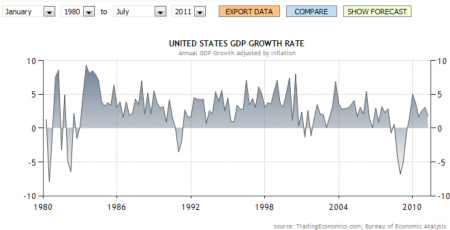 Looking at Chart 3 below you can see that GDP growth since 1980 has averaged around 3.3%. Recently GDP for the first quarter of 2011 has been revised down to a 1.9% growth rate. In other words, while 1% may not seem like it will have that large of an impact. a drop of 1% from 1.9% leaves the economy growing at a rate less than inflation. 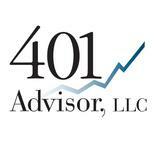 The U S economy is facing a very slow growth environment for the next decade at least. While housing should start to turn in 2014, the headwinds will still be strong as both the consumer and the government deleverage. On the plus side, large corporations have already cleaned up their balance sheets. Many have borrowed, but to take advantage of historically low rates, not because they need to. In a slow growth environment there is little need to expand plant and equipment. Wages will remain suppressed as unemployment will remain above 8% at least until we start to see a housing rebound. While the macroeconomic picture is just ugly, this actually presents a decent investment opportunity for conservative investors. With costs being contained and little to spend money on, look for more corporations to initiate and increase dividend payments.